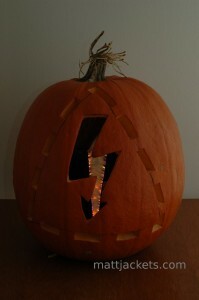 The Jacob’s Lantern — 10,000 volts of Halloween fun! This year I took part in a pumpkin carving contest. I knew I didn’t have a chance unless I had a gimmick…so I grabbed my trusty oil burner ignition transformer and some wire coat hanger. I mean, why not make a small Jacob’s ladder and put it inside a pumpkin right!? RIGHT! A few days ago I had a chance to talk to some amateur radio operators about something called Automatic Packet Reporting System (APRS). APRS is a low bandwidth data communications mechanism that operates in a manner similar to UDP multicast. Each packet is broadcast over the air, with no handshaking or acknowledgement. (Some automated systems will send an acknowledgement via a second transmission. As with UDP, this is the application’s responsibility.) 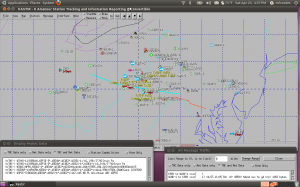 A variety of information is available via APRS such as weather data, GPS position of vehicles, and text messages. While a great majority of APRS data in my area is available on the web, what’s the fun in that? I wanted to see if I could pull the data down over the air. 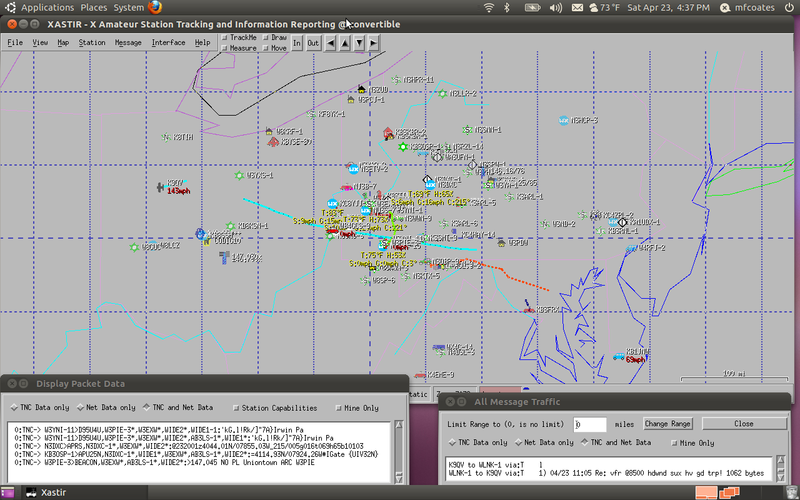 APRS is used to show all types of data: weather, car/truck/airplane telemetry, and text messages. I wrote an interface in ruby between the Twitter API and the chatterbox software MegaHAL. Why? I don’t know. Initially, I had it using the same brain developed over a few weeks of MegaHAL sitting in an IRC channel. I’ll write up the IRC wrapper later. This brain was a little too uncouth for my tastes, so I decided to start fresh for Twitter. The software gets 20 of the latest messages posted to Twitter every minute. It feeds them one-by-one into MegaHAL, and reads the reply. Due to the language it learned from IRC, the software isn’t answering @replies and isn’t posting updates anymore, it’s just learning. Once it begins to make good sense, I’ll let it post again. For now, you can view it’s progress live by clicking “more” below. UPDATE: This project is no longer active. The MegaHal process that my wrapper code spawns began consuming a HUGE amount of CPU and memory. At this point the MegaHal process cannot load it’s dictionary within several hours. This was an interesting experiment and served it’s purpose, so I’ll let it rest as it is. Big Blue Saw is having a free part day on August 6. 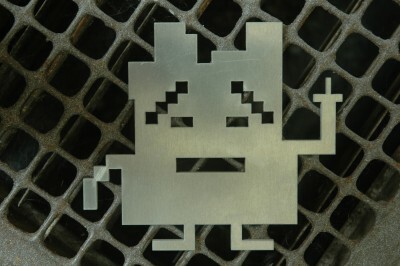 You can create one part to be made from laser cut acrylic or waterjet cut aluminum, just pay shipping. It’s a shame that I don’t have any projects right now that require any custom parts, so I guess I’ll have to order something interesting or artistic. Time to start designing! UPDATE: My part has arrived!